Some of the commonly used Git-based version control repositories such as GitHub offer features suitable for creating repos (public and private) for distributed version control and source code management (SCM) and are commonly used for storing database and database driver code. In addition to SCM, GitHub offers access control, features requests, and issue tracking. Total storage size per repo is limited to 1GB. Per file size is limited to 100MB. A warning is generated for files exceeding size 50MB. For a project release, an individual file size must be kept less than 2GB. GitLab, which offers Large File Storage (LFS) for storing large files, has a storage limit of 10GB per repo. While GitHub does not have a limit on the number of branches, the number of branches is limited by the total storage space. Scalability issues exist when synchronizing a large number of branches. Not recommended for storing database dumps, log files, binary files and installers. Not integrated with a build tool. AWS CodeCommit overcomes all of these problems or limitations. CodeCommit offers unlimited private repos with no limit on the size of a repo or on the size and type of the file stored in a repo. Large number of files and large files may be stored and an unlimited number of branches may be created. 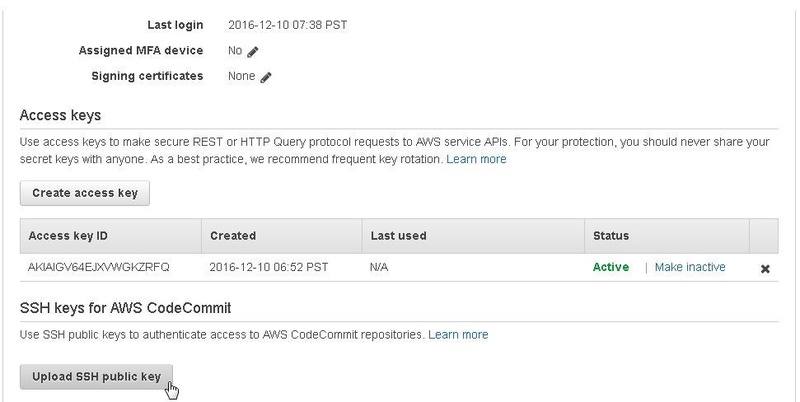 CodeCommit is integrated with other AWS services. An AWS IAM User account is more secure than a GitHub user account. AWS CodeBuild is integrated with CodeCommit to build the code in a repo. 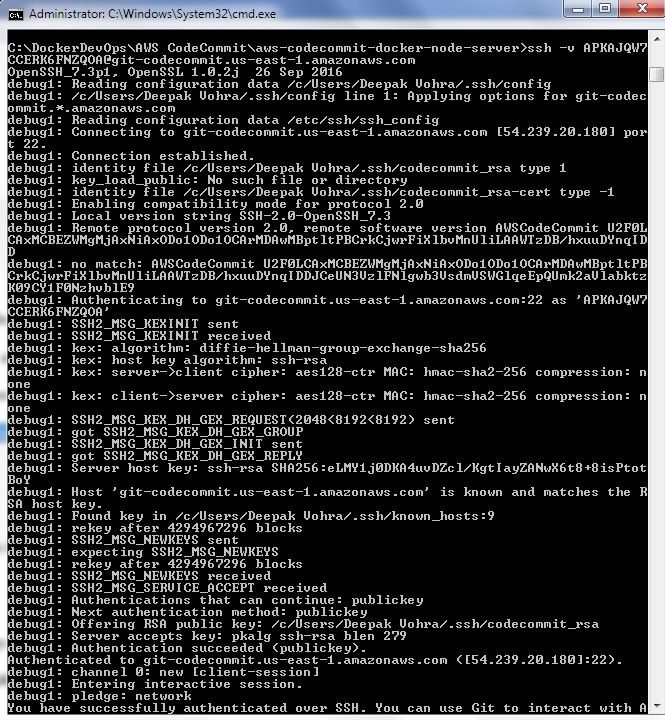 First, we shall create a GitHub repo with two files as source code for a Docker image; Dockerfile and server.js. The Dockerfile is as follows. The server.js is as follows. The dvohra/docker-node-server repo is shown in Figure 1. The same source code may be used to create a repo by a user or a different repo may be used. It is not significant which repo is migrated to CodeCommit. The Dockerfile is shown in Figure 2. The server.js is shown in Figure 3. In this section we shall migrate the GitHub repo to a local directory. Create a local directory for CodeCommit called AWS CodeCommit. Obtain the HTTPS URL to connect to GitHub as shown in Figure 4. Run the following command to clone the GitHub repo to the local directory. 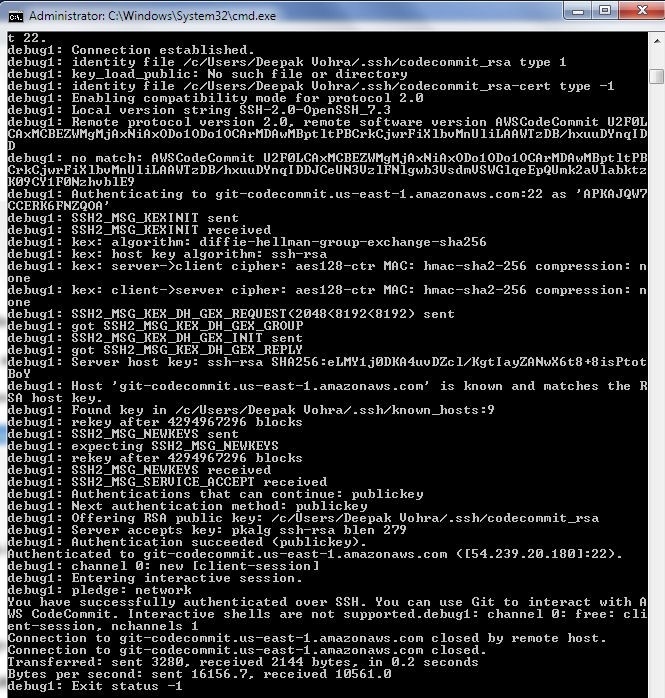 As the output indicates, the GitHub repo gets cloned to local directory. remote: Compressing objects: 100% (78/78), done. To create a CodeCommit repository, select Services>Developer Tools>CodeCommit or AWS Services>Code Commit as shown in Figure 5. Click on Get Started as shown in Figure 6. Specify a Repository name (Node-Server) and click on Create repository as shown in Figure 7. The Node-Server repository gets created as shown in Figure 8. In the following subsections we shall set up an SSH connection to AWS CodeCommit repository. First, we need to create an IAM user. The IAM User name may be different for different users but the procedure is the same. 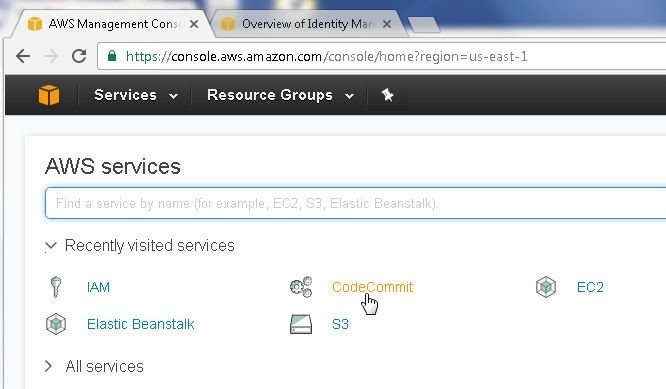 Select IAM from the Services catalog or access the Identity and Access Management Console at https://console.aws.amazon.com/iam/. Select the Users selection in the navigation. Click on Add user as shown in Figure 9. In the Add user detail page specify User name and select Access type as Programmatic access as shown in Figure 10. Click on Next: Permissions as shown in Figure 11. Next, set permissions for the IAM user. Click on Attach existing policies directly as shown in Figure 12. For AWS CodeCommit access select AWSCodeCommitFullAccess as shown in Figure 13. Click on Next: Review as shown in Figure 14. A JSON based permissions policies file gets displayed as shown in Figure 15. To use SSH to connect to CodeCommit, select the IAMUserSSHKeys policy as shown in Figure 16. Also, to use SSH to connect to CodeCommit, select the IAMReadOnlyAccess policy as shown in Figure 17. Click on Next:Review. A Summary of permissions gets displayed. Click on Create user as shown in Figure 18. An IAM user gets created as shown in Figure 19. The IAM user gets listed in the Users navigation as shown in Figure 20. 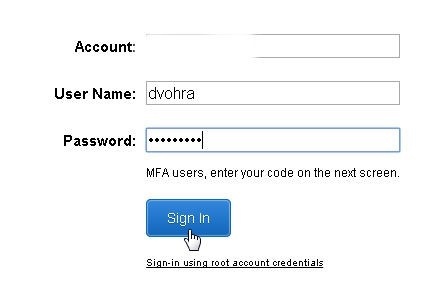 Click on the IAM user’s link to access and modify the user detail. Manage the Console password. Click on Security Credentials and select the link Console password>Manage password as shown in Figure 21. 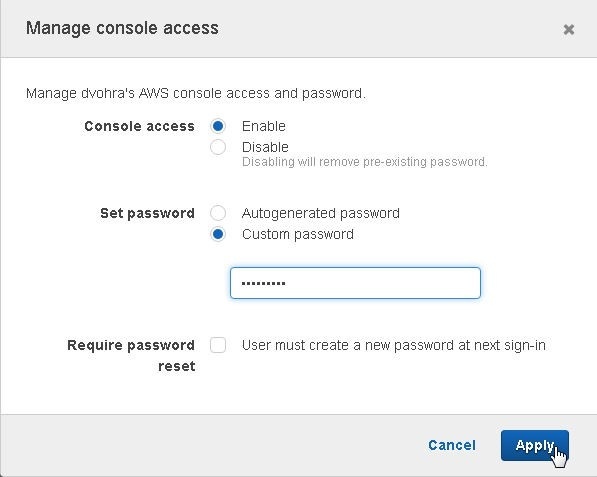 Select Enable for Console access and select Custom password for Set password as shown in Figure 22. Click on Apply. A New password dialog gets displayed to view the new password and download the .csv file as shown in Figure 23. Click on Close. Git has already been installed. Next, we shall set up a SSH Connection for Git. First, we need to set up the public and private keys for Git and AWS CodeCommit. Open a Windows command terminal and change directory (cd) to the C:\Users\Deepak Vohra\.ssh directory. Run the ssh-keygen command to create a public and private keys. At the prompt “Enter file in which to save the key” specify “/c/Users/Deepak Vohra/.ssh/codecommit_rsa”. At the command prompt “Enter passphrase” keep empty and click on “Enter”. At the command prompt “Enter same passphrase again” keep empty and click on “Enter”. A public and a private key get generated. The output from the ssh-keygen command is shown. Your identification has been saved in /c/Users/Deepak Vohra/.ssh/codecommit_rsa. Your public key has been saved in /c/Users/Deepak Vohra/.ssh/codecommit_rsa.pub. The public and private keys are shown in the C:\Users\Deepak Vohra\.ssh directory in Figure 24. 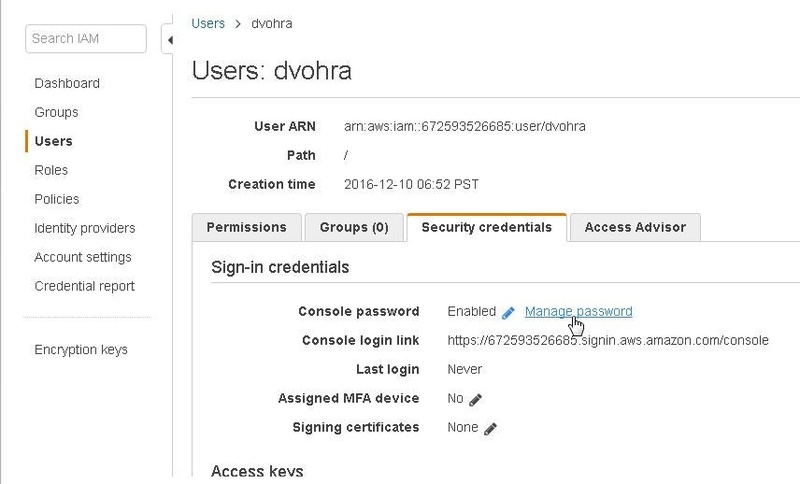 Logout of AWS Console if logged in as a user other than the IAM user dvohra created in an earlier section.-Re-Login as the IAM user dvohra created earlier as shown in Figure 25. Click on the IAM user link to access and modify the user detail. Click on Security Credentials and scroll down. Click on the Upload SSH public key button as shown in Figure 26. Open the C:\Users\Deepak Vohra\.ssh>codecommit_rsa.pub file in a text editor such as notepad and copy the SSH public key. Copy and Paste the SSH public key to the Upload SSH public key field and click on Upload SSH Public Key as shown in Figure 27. The SSH public key gets uploaded and an SSH key ID AKIAIGV64EJXVWGKZRFQ gets generated as shown in Figure 28. Copy the SSH key id as shown in Figure 29. Next, we need to add a config file to the ~/.ssh directory. In a Windows terminal, run the following notepad command to create a config file without a file extension. Note the “.” At the end of the command, which is required to create a new file without an extension. In the dialog prompt “Do you want to create a new file?” click on Yes. A config file gets created as shown in Figure 30. Copy the following listing, which includes the SSH key id for the IAM user and the SSH private key file directory path to the config file and save the file. The config file is shown in Figure 31. Set the permissions for the config file to 600 (Only the owner may read and write the file). We have configured an SSH connection for Git and CodeCommit. Next, we shall test the connection. First, we need to obtain the CodeCommit repo Git URL. Click on the CodeCommit repo link in the dashboard as shown in Figure 32. Initially the repo is empty as shown in Figure 33. Click on the link in the URL column as shown in Figure 34. Click on SSH as shown in Figure 35. Copy the Repository SSH URL as shown in Figure 36. Alternatively, click on Clone URL and select SSH as shown in Figure 37. Copy the Repository URL as shown in Figure 38. Run one of the following commands to test the SSH connection. The first command generates a verbose output. As the output from the first command indicates in Figure 39, a connection gets established. The output should include "You have successfully authenticated over SSH. You can use Git to interact with AWS CodeCommit." as shown in Figure 40. The SSH command may also include the SSH key id for the IAM user. As the message in Figure 41 indicates, “You have successfully authenticated over SSH. You can use Git to interact with AWS CodeCommit.”. The following is the verbose command using –v option with SSH key id included. Next, we shall migrate the code in the local repo directory to the CodeCommit repo. Change directory (cd) to the local repo directory aws-codecommit-docker-node-server. Using the CodeCommit repo clone URL ssh://git-codecommit.us-east-1.amazonaws.com/v1/repos/Node-Server run the following git push command to upload local repo code to CodeCommit repo. The local repo gets migrated to CodeCommit repo as shown in Figure 43. The files uploaded to CodeCommit get listed as shown in Figure 44. Click on a CodeCommit file to display the file as shown in Figure 45. To be able to use CodeCommit with AWS CodeBuild we need to add another permission for the IAM user. Click on Add permissions for the IAM user as shown in Figure 46. Click on Attach existing policies directly as shown in Figure 47. Add the AWSCodeBuildAdminAccess permission as shown in Figure 48. 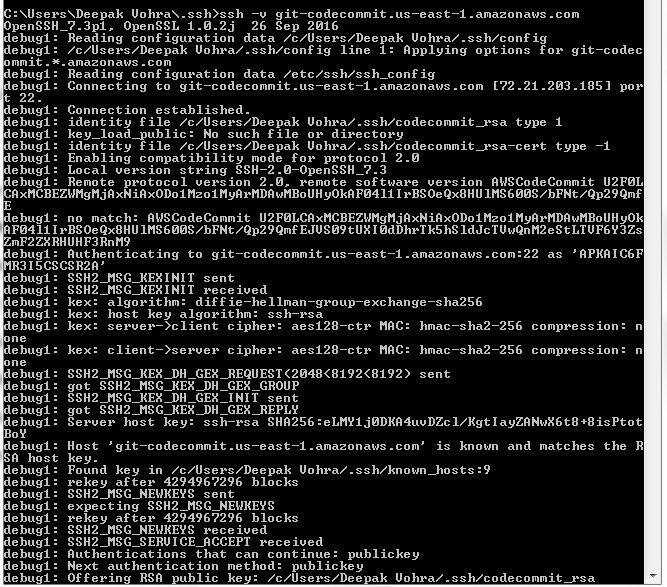 In this tutorial we introduced the AWS CodeCommit developer tool. We discussed setting up a CodeCommit repo and configuring SSH for Git and CodeCommit. Starting from a GitHub repo, we migrated the code to CodeCommit repo. In a subsequent article we shall explore continuous integration of CodeCommit code with AWS CodeBuild.